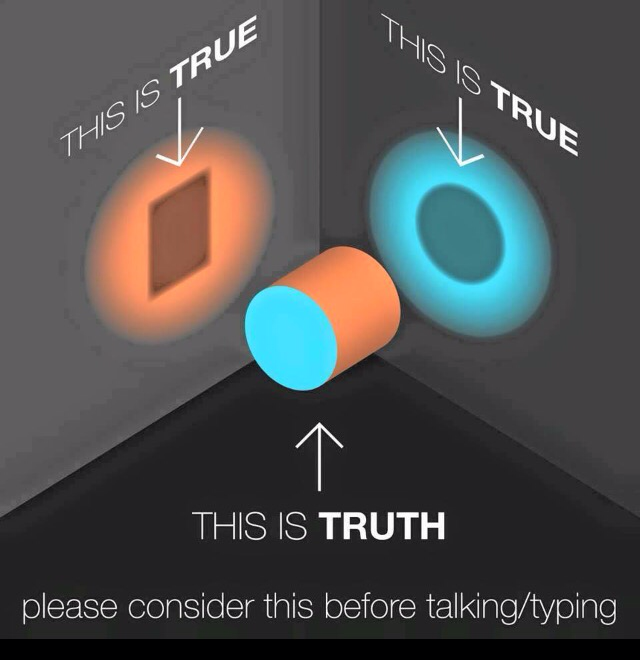 Two people can view a singular ABSOLUTE TRUTH and each declare a SUBJECTIVE TRUTH from their perspective. Each observes something that appears to contradict the observation of the other. Yet neither are wrong. Does this mean there is no absolute truth? No. Rather they each view the absolute truth from the subjectivity of their perspective. By discussing their perspectives they have the ability to learn more about the objective truth. Even still, the truth they know is subject to their two perspectives, and further, their ability to accurately communicate their perspectives to each other. Can they ever know the absolute truth? Only if the truth itself declares it to them. Then each observer would understand the truth according to it’s absolute reality. The article and the image made me think about how we, as believers, sometimes react and interact with each other in discussions over the tenets of our faith, over truth, and over who God is. This conversation I’ve created falls short in so many ways, but I did it because this is what I see so often in conversations about faith and who God is. Neither the illustration, nor the conversation, holds true of God, who is without beginning or end, or to our relationship to Him or in Him. It’s only meant to represent what I’ve seen and heard from some believing friends and it’s also true of myself at times. OSBC : “My dear children, please don’t fight! You are both right in your perceptions from where you stand right now, but you are both wrong in your conclusions. Your perspectives are limited. You are finite in nature. You each only have a small part of the truth because you cannot see the whole picture. Perhaps if you could stand in each other’s shoes for a few minutes, you would gain understanding and learn from each other. Open your eyes and your hearts and try to see the bigger picture rather than immediately judging each other. That only drives you further apart. The truth is that I am so much more than you can see or know right now, but one day you shall see me fully and you will know me fully. In the meantime, be patient with each other, listen to each other, learn from each other and grow in your knowledge and perspective of who I am. Stop arguing over who is “right”, which is futile and non productive. Start loving and nurturing each other and start growing and working towards the whole truth of who I am. Together! PS: A year later, I discover who I believe is the creator of the original poster (which is a little different in colour and content from the one above that I found on Facebook). I am posting that one here, now, and giving proper credit for it to TeriRoss at Rabadaba. I love the confirmation of the meaning of the poster! What the circle and square (personified) are seeing is the world as a reflection of themselves. Which is really what we all are limited to seeing I suppose. It would be an interesting world if we understood that what we see is a reflection of ourselves, and even more interesting if we could see that everyone’s perception of “reality” is merely their own reflection of themselves. I agree that everyone views the world through their own individual frame of reference, their own worldview, so to speak, which colours their world, so I agree with that you are saying in that particular sense. In my comments, however, I chose to look at it as seeing God, and what we can know of him as finite beings. In this case, God is, in fact, much more than simply a reflection of ourselves, and, as believers, He shows us this continually. In matters of faith, we are stretched to view ourselves differently, and to view others differently, in an ongoing process of change. That’s what I tried to reflect in my “conversation” between two still very “short sighted” believers talking to each other about who God is. I may not have done the best job…..but it interested me enough to try. This entry was posted on November 29, 2015 by annj49 in Blog, Writing 101 and tagged Absolute Truth, Faith, God, Love, perspective, truth, Writing 101.